I wanted to let you know that from September 20 to October 20, 2013 I will be traveling to Japan! I am going to be lecturing on traditional astrology and astrological magic, plus giving astrological magic ritual workshops. I also will be doing some Buddhist pilgrimage, including going to Koyasan, the headquarters of Shingon, a Japanese Tantric Buddhist sect for the kechien kanjo tantric initiation. So in practical terms this means that I won't be doing much posting or blogging during this time period. We are going to keep taking orders, so if you want to get talismans, books or courses, you will still be able to do so during my trip, though the response time is likely to be delayed a bit. I want to mention a little about how my ritual practice has been effected by Japanese & Buddhist ritual and practice. For the last 3 years I have been doing an intense Zen Buddhist practice, doing zazen, sitting meditation every day, with trips to an Iowa Zen monastery for intensive weekend meditation, called sesshin, about every other month. One of the problems with Hermetic magic, like Picatrix, is that we have only the skeleton of the ritual practice. We have the prayers, suffumigations, spirit names and talisman materials and designs and not much else. I've realized that if I am going to do astrology and magic, practical spiritual work, that I want to do it in the context of an overall spiritual path, in order to stay centered spiritually. There are many possible paths, Buddhism is certainly one. I have found zazen, sitting meditation to be invaluable, but I also am very intrigued by tantric Buddhism which uses ritual directly. 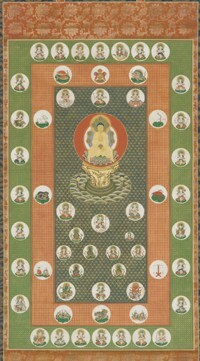 I've started what I call Western Tantric Buddhism, melding traditional astrological magic into Buddhism. What's very interesting is that astrological magic is already there! Japanese (Χnese) Buddhism already use astrological ritual and magic as you can see here. So, I'm looking forward to my trip and learning more about Japanese astral ritual!